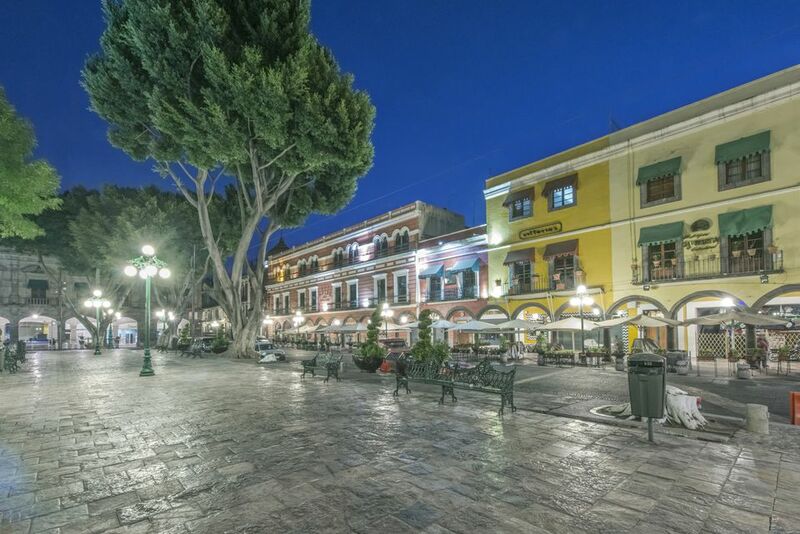 Wandering around Puebla's exceptional historical center, you'll be astounded by the number of lovely colonial buildings with charming detail and colorful tiles, and be surprised by glimpses into elegant courtyards. The Palacio Municipal, Puebla's town hall, is located on the Zocalo's north side and was completed in 1906. The building is an example of the Franco-Spanish Renaissance style typical of public architecture in Mexico during the rule of Porfirio Diaz. 16 de Septiembre at the corner of 5 Oriente, on the south side of the Zocalo. Puebla's cathedral, dedicated to the Immaculate Conception, is a treasure of colonial art. Designed by Francisco Becerra, the first stage of construction took place between 1575 and 1618. The initial plans included four corner towers like the cathedral of Valladolid, Spain. The bases of the towers were built and stand as testimony to the lofty plans. The second phase of construction was under the direction of Bishop Juan de Palafox y Mendoza who consecrated the cathedral on April 18, 1649. The main facade, in the sober Mannerist style, is made of dark gray quarry stone and was completed in 1664. The towers are over 200 feet (70 m) high, the tallest in Mexico. The main altar was designed by Manuel Tolsa and built between 1797 and 1819. The choir is an exquisite example of Mudejar (Moorish) artwork with inlaid wood in eight different colors. Next stop: Santo Domingo Church with its ornate Rosary Chapel. From the cathedral, walk north along 5 de Mayo to the corner of 4 Poniente. The Santo Domingo church is on the northeast corner. ​​​Corner of 5 de Mayo and 4 Poniente. Construction of the Santo Domingo church took place between 1571 and 1611, except for the left tower which was not completed until the 19th century. The dark gray facade is severe, but the interior of the church is more ornate, with gilded stucco work. The impressive main altar dates to 1688 and is attributed to Pedro Maldonado. To the left of the main altar is the Rosary Chapel (pictured above), built in 1690. This is an outstanding example of Mexican Baroque, with dazzling use of gilded stucco and onyx stonework. Next door to the Santo Domingo church, at 5 de Mayo 409, is the Galeria Bello y Zetina. This small museum features 19th century fine and decorative arts, with paintings by Jose Agustin Arrieta and Gerardo Murillo Cornado (known as Dr. Atl). Entrance is free. Next stop: El Calle de los Dulces. Walk half a block north to 6 Oriente. 6 Oriente street is known as El Calle de los Dulces "Sweets Street" or "Candy Street" because of the number of dulcerias (candy shops) along here selling a wide variety of traditional candies, cookies, and other Poblano specialties, notably dulces de camote, traditional sweets made from yams, and tortitas de Santa Clara, cookies with a topping made of cream and ground pumpkin seeds. Next stop: the Museo de la Revolución. Walk east along 6 Oriente, number 216 is the Revolution Museum. 6 Oriente No. 206. The museum opens 10 a.m. to 5 p.m. Tuesday to Sunday. This building, which houses the Mexican Revolution Museum, is also known as the Casa de los Hermanos Serdan, (House of the Serdan brothers). The first battle of the Mexican Revolution took place here on November 18, 1910, when the Serdan family were betrayed two days before the planned uprising against President Porfirio Diaz. The house retains the bullet marks from the battle. The museum depicts the life and times of Aquiles Serdán (1877-1910) and his family​ and has a room dedicated to the women of the Revolution. Next stop: Teatro Principal. Walk east along 6 Oriente until you reach 6 Norte. Here you are approaching the Teatro Principal from the back. Walk around to the front of the building. 8 Oriente, corner of 6 Norte. Next stop: Barrio del Artista (Artists' neighborhood). Walk south on 8 Norte, you will be walking through the Barrio del Artista. The "Artists' Neighborhood" 8 Norte, between 4 and 6 Oriente. In colonial time, this area was occupied by textile mills. It was remodeled in 1941 but retains a strong colonial feel. There are statues and ornate decorations to admire here, as well as many artists' studios which are open to the public, where you can see artists at work, purchase their work or have your portrait drawn. Occasionally open-air concerts and theatrical presentations take place here. Next stop: La Casa del Alfeñique, the meringue house. Walk west along 4 Oriente to 6 Norte. On the northeast corner is the Casa del Alfeñique. Alfeñique is a type of candy that is similar to meringue. This house gets its name from the elaborate stucco-work reminiscent of this sugar and egg-white concoction. This was the home of Ignacio Morales, a wealthy ironworker, who ordered the house built in this style to humor his fiance (who was apparently very fond of meringue). The house was built in 1791 by architect Antonio de Santa Maria Inchaurregui. The Casa del Alfeñique houses the Regional Museum of Puebla, which is open Tuesday to Sunday from 10 a.m. to 5 p.m. The interior is beautifully restored, the first two floors have exhibits depicting the history of Puebla and on the third floor, you can see period furnishings and the family chapel. Next stop: Mercado El Parian, the handicrafts market, located on the southwest corner of 4 Oriente and 6 Norte. El Parián Handicrafts Market, 6 Norte, between 2 and 4 Oriente. This is the shopping portion of the walking tour! The market was established in 1796. Here you will find a wide variety of poblano crafts, including Talavera pottery, textiles, clothing, onyx figures and traditional candy. Handicrafts from other states are also available, as well as jewelry and leatherwork. Next stop: Plazuela de los Sapos, "Toad Plaza." Walk down 6 Norte. After crossing Avenida Juan de Palafox y Mendoza the street becomes 6 Sur. Continue along 6 Sur to 5 Oriente and you are in the Plazuela de los Sapos. "The Plaza of the Toads" 6 Sur, between 3 Oriente and 7 oriente. On Sundays, there is an outdoor antiques and flea market set up here, but any day of the week you can visit the antique shops along the plaza or enjoy a drink in one of the bars or restaurants. Many of the establishments here have live music in the evenings. The San Francisco River used to run along where the Heroes del 5 de Mayo Boulevard is now, one block from 6 Sur. The river was diverted but the toads that used to proliferate in the area close to the river left their name. There is a small but famous cantina on the corner of 5 Oriente and 6 Sur, called La Pasita, which serves a special raisin liqueur. Next stop: Casa de los Muñecos, "House of Figures." Walk along 5 Oriente to 2 Sur, turn right and walk north two and a half blocks (the name of the street changes to 2 Norte). At number 2 on 2 Norte, you'll see the ​Casa de los Muñecos. "The House of Figures," 2 Norte 2. The Casa de los Muñecos houses the University Museum. This building combines elements that were common in Pueblan 18th Century Baroque architecture: stonework, brick, tile panels, mortar, and ironwork. There are human figures depicted on the tiles which have been interpreted in different ways. The most common legend is that the owner of the house, Agustín Ovando de Villavicencio, wanted to build a third floor on his home. The city fathers would not allow it so he took his request directly to the king who granted his authorization. He built his third floor and had tiles making fun of the city fathers placed on it. An alternative interpretation is that the figures depict the trials of Hercules. This is the end of the Puebla walking tour. Walk south on 2 Norte to the Zocalo (only half a block). You might enjoy a refreshing drink at the Royalty Restaurant on the North side of the Zocalo.